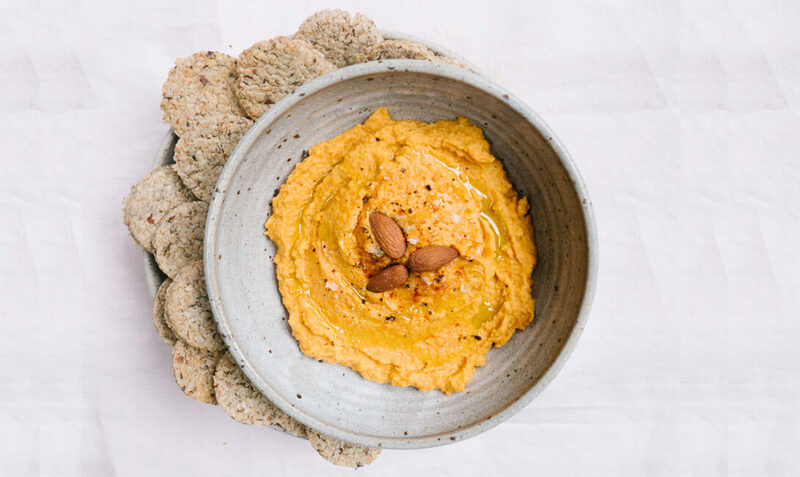 London-based food writer, presenter and serial dinner party host Alexandra Dudley shares regular recipes and tips for sustainable living on her blog and is the author of Land & Sea: secrets to simple, sustainable, sensational food. Here she shares 5 simple recipe ideas for travellers who want to eat healthily and sustainably on the move. Find out more here. These make a wonderful on the go snack. I came about the recipe after a fridge clear out. I was about to go travelling and wanted to make use of all the food left in my fridge as I hate waste. Faced with a rather dried out, skinny bunch of herbs (no doubt leftover from a Sunday roast) I set about rummaging through my cupboards. 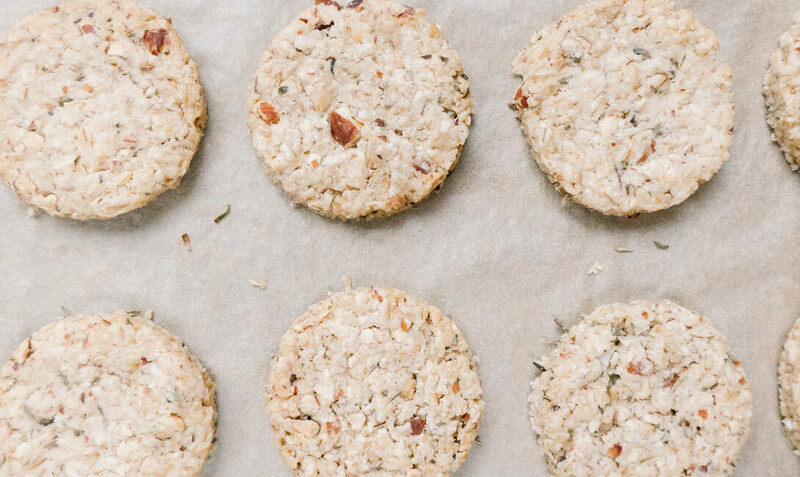 I always have almonds and oats and decided to make oat cakes using the leftover dried herbs. They turned out delicious and were the perfect snack for my journey. I now make them regularly and often pack a few in my bag. The almonds give them a wonderful crunch and the herbs make them a lot more interesting than a standard oat cake. You can use any sort of tough herb here – rosemary, thyme, oregano all work very well, and don’t worry if they have dried out a little, this almost works better. You could even add a pinch of chilli powder if you fancy a bit of spice. Preheat your oven to 180° and line two baking trays with parchment paper. In the bowl of your food processor pulse the oats until the resemble a rough flour. Then transfer them to a medium sized mixing bowl. Next place your almonds in the food processor and pulse until well broken down. You want them to be uneven sizes to add texture to the oat cakes but they should be no bigger than about 1/3 of an almond. Add these to the mixing bowl with the oats. Add your salt and chopped herbs and stir everything together to combine. Next add your boiling water and olive oil. Stir until you have a collected dough. Roll out the dough with a floured rolling pin until it is about the thickness of two one pound coins. Use a 4cm cookie cutter cut out rounds. I like to roll the dough on a silicone baking sheet or some parchment paper to avoid having to add more flour to the dough. Once you have stamped out as many oatcakes as you can collect the dough together and roll out again. Repeat until all the dough has finished. Place your oat cakes onto the prepared baking sheets and bake for 40 mins turning and switching oven shelves half way to ensure an even bake. dry out completely. Remove and allow to cool. Enjoy with cheese, dipped into hummus, spread with avocado or almond butter or just as they are. Store in an airtight container and consume within 2 weeks. This delicious and healthy dip is a great way to use up any floppy looking carrots and save them going to waste. Pop it in a little tupperware or jam jar and enjoy it with crackers, oat cakes or chopped veg. Add a spoonful to spruce up a salad or spread on bread or toast to pimp your sandwich. The almonds give it a wonderful nuttiness and creamy element too. If you like spice you can add a touch more cayenne pepper, but if not the 1⁄2 a teaspoon won’t blow your head off so don’t worry. Preheat your oven to 200° fan setting and spread your almonds on a clean, dry baking tray. Roast for 10 minutes until they begin to smell nutty. Remove and allow them to cool. Bring a medium sized saucepan to the boil, add your carrots and cook until soft enough to pierce with a fork. Drain and allow to cool. Place your roasted almonds into a food processor and process until they begin to form a smooth paste. Be patient at this stage. It may take up to 7 minutes. Once your almonds are well broken down and smooth add your carrots, mixed spice, cayenne pepper, salt and olive oil. Process again until everything has broken down to a hummus like consistency. You may need to scrape down the sides of the food processor a few times with a spatula. Enjoy as a tasty snack with crackers, oat cakes, toast, chopped veg. Store in the fridge for up to 5 days. 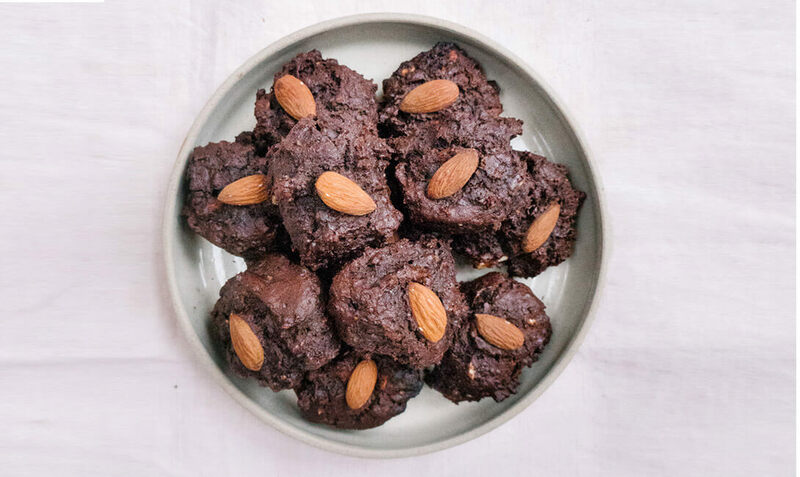 somewhere between a banana cake, a brownie and a chocolate muffin – all good things. They are simple to make and work very well as an afternoon pick me up or even as a breakfast enroute. in your almonds and chocolate. In a larger bowl smash together your overripe banana using a fork. Add your melted butter or coconut oil, honey and egg and mix until well combined. Pour your flour mix into your banana mix and fold to combine. Using two teaspoons drop roughly golf ball sized spoonfuls onto your parchment lined trays. cake and brownie. Keep for up to four days in an airtight container. I must confess that whenever I make granola it is usually less than half of it that sees the depths of a breakfast bowl. For the most part I enjoy snacking on granola in handfuls from the jar. 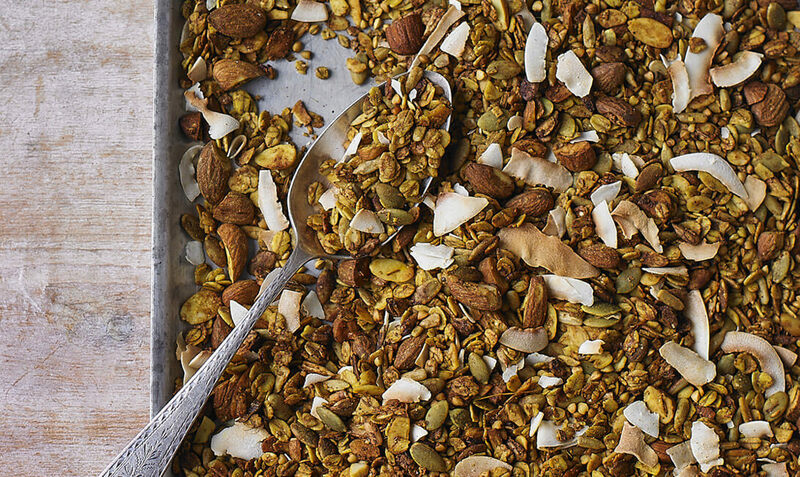 This savoury granola is perfect for snacking and a nice change from my usual sweet snack. I take it with me in a tupperware or small jam jar and keep a big jar of it in the kitchen to reach for handfuls from when I’m feeling peckish. Preheat your oven to 160 degrees fan setting and line a large baking tray with parchment paper. Combine all of your ingredients apart from the flaked coconut in a large bowl and stir to combine. Spread everything onto the tray and bake in the oven for 20 minutes tossing half way. Five minutes from the end stir through your coconut. The granola should be crisp and dry. Allow it to cool completely before storing in an airtight container for up to 5 weeks. Less of a recipe and more of a tip – my biggest advice for sustainable snacking is to invest in a good snack tin. I usually keep a handful of almonds in mine as they’re brilliantly satisfying and healthy too. Otherwise I might fill it with trail mix or my homemade savoury granola. If you’re ever caught off guard without a snack, try to go for something that has its own packaging such as a satsuma or a banana, avoiding pre cut fruits and veg if you can. Instead try and get into the practice of filling the bottom of an empty jam jar with hummus or my almond carrot dip at the bottom and sticking in some fresh chopped veggies on top.